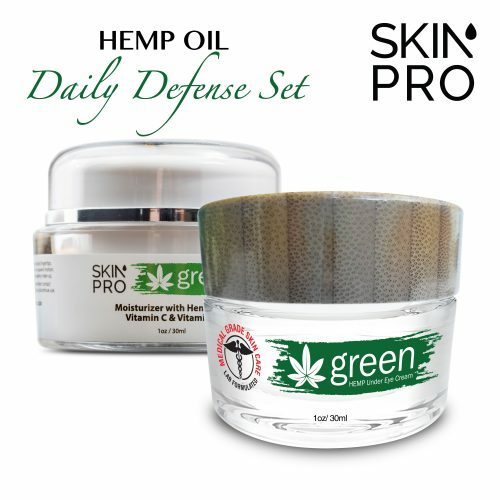 Due to the extreme popularity of our CBD skin care product line, we’ve decided to make it even easier to protect your skin. Our new “Daily Defense Hemp Oil Skin Care Set” allows you to save money on both of our best selling products featuring full-spectrum CBD hemp. First, apply a pea sized amount of the hemp oil eye cream to the area below your eyes. This will lessen the appearance of dark circles while targeting eye wrinkles, bags, and puffiness. Repeat this step of the process before you go to bed. Next, apply the daily hemp oil moisturizer to your entire face. Made with hemp oil, Vitamin C, and Vitamin E, this will help hydrate irritated skin and promote a brighter-looking appearance. Purified Water, Glycerin, Medicago Sativa (Alfalfa) Seed Extract, Hydrolyzed Lupine Protein, Saccharomyces, Cervisiae Extract, Butylene Glycol, Persea Gratissima (Avocado) Oil, Simmondsia Chinesis (Jojoba) Seed Oil, Stearic Acid, Cetyl Alcohol, Hydrolyzed Collagen, Retinol, Glyceryl Stearate, Peg 100, Dometicone, Caprylic/Capric Triglyceride, PCR Hemp Oil, Peg-16 Macadamia Glycerides, Octyldodecanol, Propylene Glycol, Zea Mays (Corn) Oil, Tocopheryl Acetate, Cholecalciferol, Retinyl Palmitate, Ascorbic Acid, Pyridoxine HCI, Silicate, Sodium Propoxyhydroxipropyl Thiosulfate, Silica, Polysorbate 20, Phenoxyethanol, Caprylyl Glycol, Potassium Sorbate, Hexylene Glycol.